A new shower system which can cut down the time required to bathe a wheelchair-using patient by more than half is currently under trial for two weeks at the Ren Ci Community Hospital in Novena. Ren Ci is working with the Agency for Integrated Care to assess the benefits of this new equipment and to share its insights with other organisations in the community care sector. The shower is called the Viami RS-05. The patient is seated on a specially designed commode chair and pushed into the machine. The machine sprays the patient with jets of soap and water. The water temperature and the amounts of soap and water used each time can be regulated. Following the shower, the machine undergoes a 70-second disinfection process to prepare it for the next user. The innovation also offers more privacy during bath time and prevents the risk of injuries. 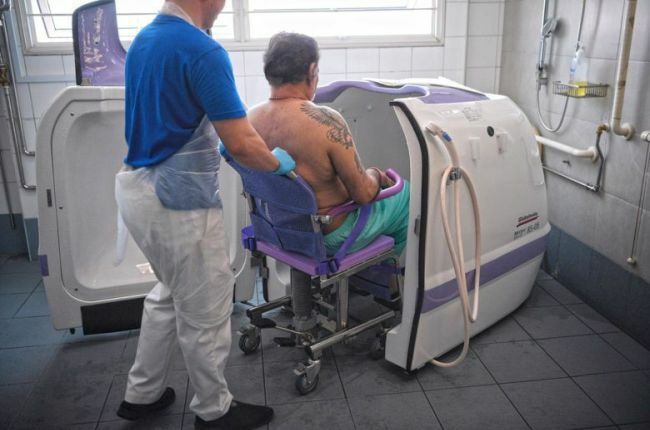 Mr Simon Francis, 66, who was admitted into the hospital for chronic obstructive pulmonary disease and therefore needs the use of a wheelchair, has been having his morning shower with the help of the new system. Mr Francis said he prefers using the new machine compared with a manual shower as it saves him time and is very comfortable. "I can do more things now. Since I bathe faster, I can watch more TV and eat breakfast earlier," he added. While the machine washes the patient's body, the nurse can wash the patient's hair and face, allowing for quicker showering. It has helped cut shower time from the usual 10 to 15 minutes to only five minutes. The hospital is the first in the intermediate and long-term care sector to trial such a showering system. Should the hospital buy the machine, it would be used for 62 patients who are unable to shower without assistance.